I want you to really think about joy. Think of the joy of a small child playing. Think of how that joy lights up a child’s entire face. It seems as though they shine as brightly as the sun. Then life passes by and often that sun sets. We spend our adult lives searching for moments of joy. And here and there they appear: a wedding day, the birth of a child or perhaps even in an amateur puppet show. 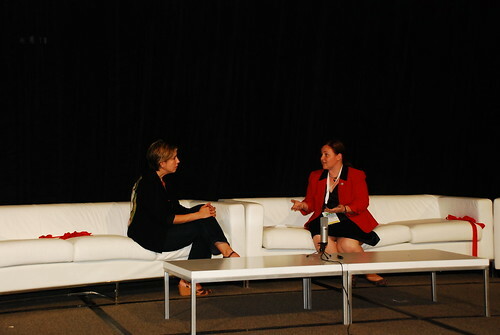 On the evening of September 25th 2011, an ensemble of dedicated healthcare enthusiasts gathered on the main stage of Health 2.0. We gathered at the same time that the Health 2.0 VIP cocktail reception was under way. Other than our small group the venue was completely empty. Some of the performers had weeks in which to prepare and some of them were drafted on the spot. Several attendees from the Office of the National Coordinator of Health Information Technology thought they would be the audience, but instead became puppeteers. We were able to film and perform the show three times. It was wonderful. Each time the cast offered great ideas to improve the performance. As their arms shook with fatigue, they smiled and danced and rapped. They were brilliant. From my perspective on the stage over looking the row of puppeteers and voice talent, I can assure you I saw a look upon their faces like those of my pre-school students. Their faces shone as bright as the sun and we created a rainbow. The puppet show came very close to not happening at all. It was an idea that came out of a data group planning committee meeting for Health 2.0 San Francisco. We had been discussing some elaborate data sharing concepts and agreed that many were complex and needed more explanation. I suggested we could do a short puppet/Muppet show explaining the Rainbow Button Initiative. After the call, I spoke more with Hamish MacDonald, co-founder of Lifetime Health Diary, and Mark Scrimshire of HealthCamp about the play. There would be puppet roles as well as actors in the tradition of Sesame Street. Then I had the honor of speaking to the famous Ross Martin, composer and lyricist of “Meaningful Yoose Rap.” He agreed to do the rap. We were ready to roll, but in the week preceding the event, I got the dreaded email from the Health 2.0 staff. The show schedule was running long. We would have to cut the puppet show to less than five minutes. As such a cut would remove most of the speaking rolls, I told Health 2.0 to pull the show from the schedule. I shared my sadness with Mark Scrimshire. He came up with a brilliant idea. We could film it at Health 2.0 and post it online. I responded that we could even enter it into the Disposable Film Festival sponsored by Practice Fusion. Several amazing folks agreed to play their roles onstage as people not puppets. Lygeia Ricciardi, Senior Advisor for Consumer e-Health at the Office of the National Coordinator of Health Information Technology would play herself upon the stage as puppets began explaining the Rainbow Button Initiative. Claudia Williams, Director of State Information Exchange Program at HHS, Office of the National Coordinator of Health Information Technology, would also play herself until we realized we needed a voice to play the Earth Mother/Green Button and she would quickly change rolls. She dove into the roll and even performed a rap with no preparation. I too would be on stage as the patient/caregiver trying to navigate these data access waters. Mark Scrimshire, the co-founder of Health Camp Foundation, would appear onstage as the white button and would rap as well. Each puppet had a voice actor and puppeteer, and wow, what a team each pair made! The puppeteer Andre Blackman performed the part of the doctor. Andre is very involved in public health and is the Director of Digital Communications/New Media at the American Heart Association. The voice talent for the doctor was Jim Hansen Vice President and Executive Director of Dossia Consortium. 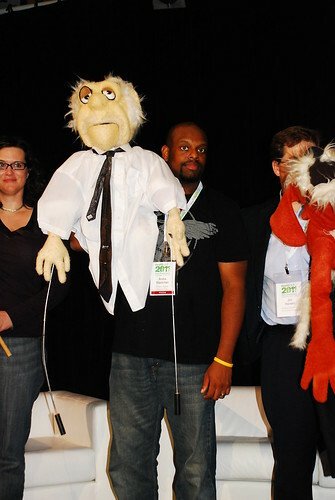 Erin Poetter, of the ONC was the puppeteer for the Nurse Puppet. Sunnie Southern, founder and CEO of Viable Synergy, provided the voice for the Nurse. The loveable dog was the voice and puppeteer work of Lon Levin, Illustrator and Designer of Levinland Studio. Award for best eyebrow manipulation must go to Katerina Jackson-Suchkova http://www.flickr.com/photos/60284414@N05/6198652217/, marketing director of Lifetime Health Diary, as the puppeteer of the Medical Records Department Puppet! Dan Munro, CEO of iPatient, was the voice talent that greatly augmented these amazing eyebrows. An archetypal character puppet portrayed each Button that creates the Rainbow Button Initiative. 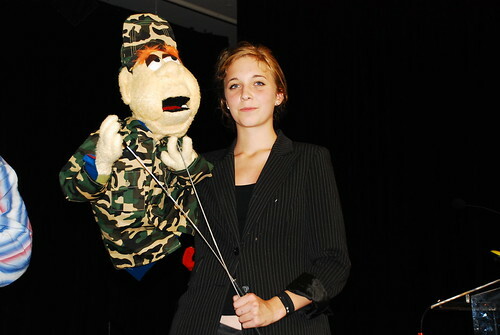 A Military Puppet represented the VA Blue Button. 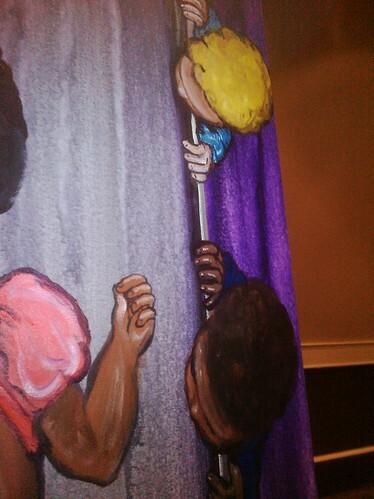 The puppeteer was Megan Mitchell, a 15 year-old artist from Washington DC. The Voice talent was proved via the booming voice of Matthew Browning, RN and CEO of YourNurseIsOn.com. The Green Button was designed as an Earth Mother Puppet. Claudia Williams proved the voice of the Green Button and her puppeteer was the hard working Erin Poetter. The last button to be portrayed by a puppet was The Red Button representing privacy. We thought a celebrity puppet would be an understandable puppet representing a need for privacy. 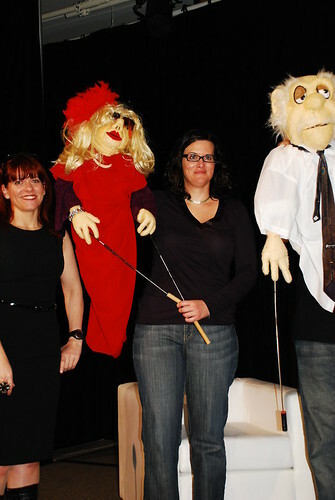 Cindy Throop, Health IT research Analyst for RTI, was the puppeteer of the Celebrity/Red Button Puppet. 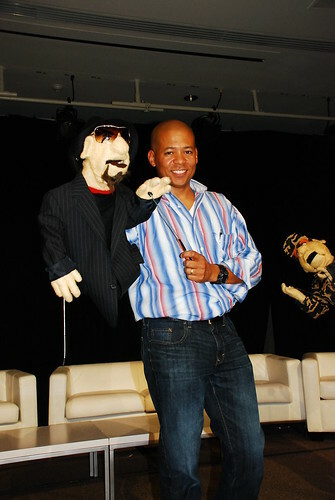 The celebrity puppet was even granted her own bodyguard played by Alex Fair, CEO and founder of FairCareMD. He was wonderfully intimidating in a Secret Service kind of way. Louise Schaper the CEO of the Health Informatics Society of Australia was amazing as the voice talent of the Celebrity puppet. Her Australian accent gave this puppet quite the celebrity flair. We had the honor of being filmed by Gregg Masters, CEO of Xanate Media with still photography taken by the Health 2.0 staffer. Gregg also edited the production and posted it online. That was all of us. We were patients, providers, techies and employees of the government. And we were filled with joy. 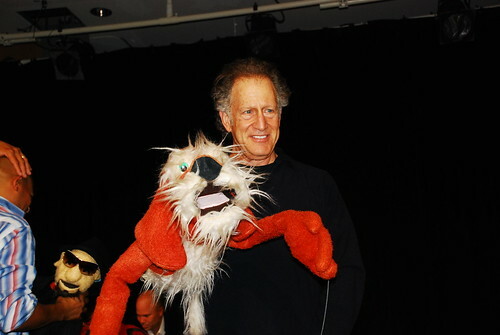 It may seem that a puppet show is a silly and simple thing, but puppets can do amazing things. They can explain complex concepts, like reading or data sharing in health. They can even help you say goodbye. As we ended the session, I explained where the puppets came from. 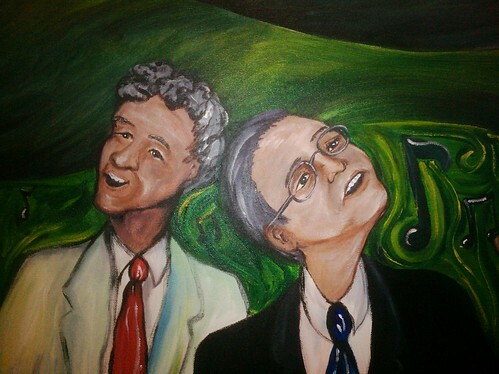 They were a wedding gift to Fred and I from his teacher Gerald Snelson. We had loved these puppets and I know Fred would be so glad to see them used in this new way. For Fred was a puppeteer himself, and if you have not seen it yet. Here is his final puppet show. Last week I attended the Adventist Health Physician Leadership Symposium focusing on Quality and Technology in Sacramento, California. 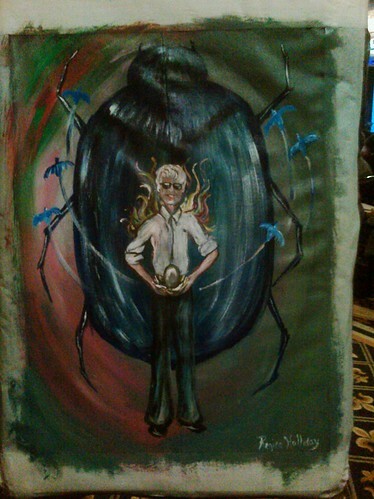 It was a lovely conference and I attended and painted the sessions all day on October 18th and the morning of the 19th. I also delivered a keynote speech. The first painting is "Bursting into Song." 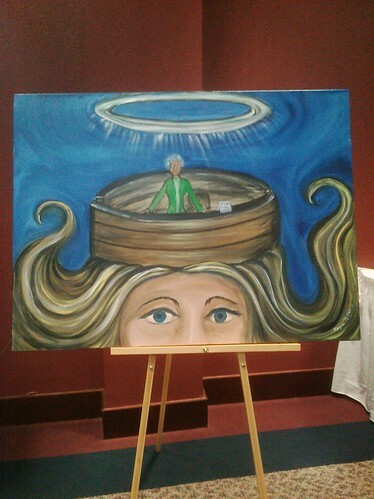 This painting was inspired by the morning session. As the conference began, Scott Reine, Executive VP/COO, Keith Doram, MD, VP, CMO and Steve Margolis, MD, Asst VP, CMIO welcomed all the attendees, but especially the folks representing the rural health facilities. And so the painting began with a sky at dawn painted in swirling tones of red. On the distant hills rise two barns with two silos. Ever so small doctors walk toward the viewer leaving these hills behind. In the foreground are two other doctors. These doctors are Barry Levy and Ed Schick. The are singing and their hands are raised in supplication or praise. They are singing a musical: Damaged Care: The Musical Comedy About Health Care in America. I could not believe it, I was attending a medical conference where Doctors where singing about the failings of our current health system. It was beautiful and tragic. 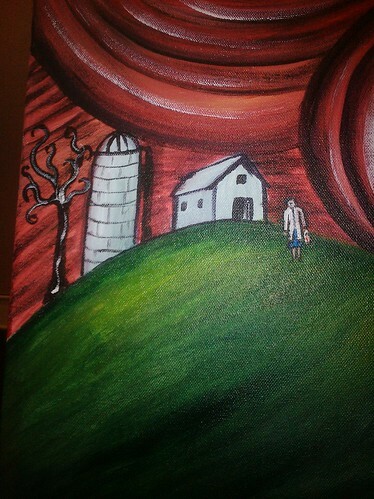 I painted them as I would paint the character Curly in the opening stanza of the first musical "Oklahoma." They may be singing about the effects of damage but they are also are singing of hope. They are pointing out the care we could have if we changed our system. Oh, what a beautiful morning that would be. The next painting is entitled "CDS." It was inspired by a speech given by Scott Weingarten, MD, MPH from Zynx Health and a following speech by Dr. Eric Hartz, CMIO of Eastern Maine Medical Center. 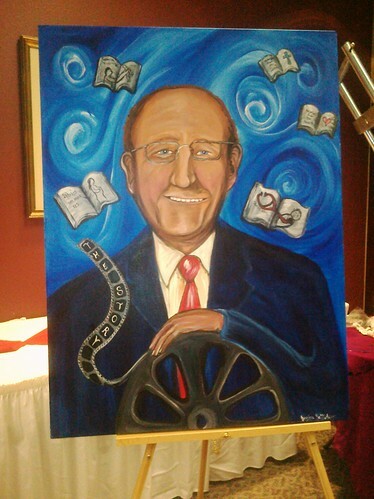 This painting started as three red letters: CDS, the abbreviation for Clinical Decision Support. As Scott began talking about the power of tools such as CDS to help people, the letters CDS became the dancing forms of human beings. The C was a woman with her back arched, The upright stroke of the D, a man looking out at the viewer. The curve of the D as a pregnant mother. Finally the S was another woman in the midst of a spinning dervish. Scott wanted us to see the people in the picture of medicine. He even showed us a stock photo image in support of ACO's (Accountable Care Organizations) and explained everything that was wrong with the picture. I almost jumped for joy! If you have read my blog, you probably know I despise stock photography and it was delightful to hear a Doctor as upset as I was by unrealistic images. Later Dr. Hartz spoke in depth about CDS in relation to cancer care. He explained blood transfusion protocol. Now, the painting began to storm with emotion. The blue sky began to fill with purple tornadoes of change. Tornadoes are scary, change is scary. From the questions I heard from the audience, quite a few people were scared of the change to come. Within this maelstrom, IV towers with blood transfusion bags dot the landscape. 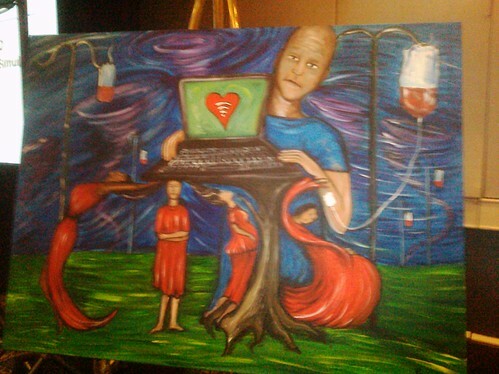 In the center of the painting a cancer patient holds up a lap top with the help of a tree. In the center of the lap top screen is a heart. 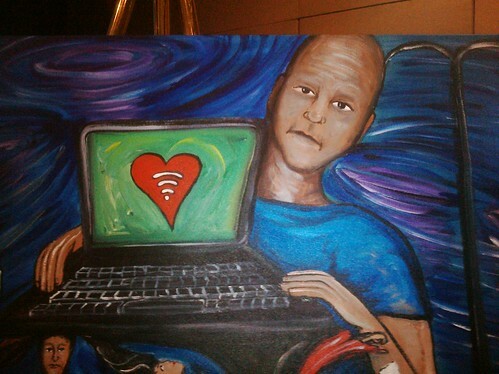 Within the heart is the symbol for a strong WIFI signal. This image refers to an earlier comment in the day, "We may love technology, but it cannot love us back." No, technology cannot love us, but we can use that tool to show our love for others. 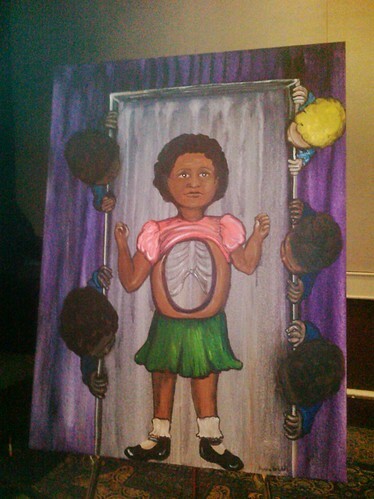 The final painting is called "Open and Transparent." I love this painting. It refers to a term we hear often in Health IT and patient rights. But what does it really mean to be open and transparent? The last speeches I had the honor of hearing were performed by Phil Kibort, MD, CMO Children's Hospitals and Clinics of Minnesota and Karen Mathias, RN Director of Simulation Center of Children's Hospitals and Clinics of Minnesota. They spoke lovingly of the pediatric care they provide in Minnesota. They explain their decision to create a bus that would tour the state giving rural hospitals a chance to practice using their crash carts in simulated pediatric care. 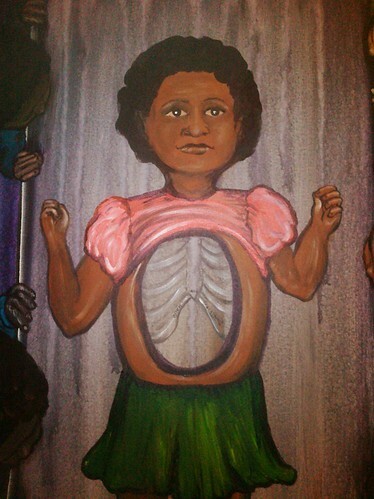 So within the painting, we see a little girl in surgery. She is not smocked and covered. Instead she is dressed as the little girl she is, so precious to us all. Her chest is open and a transparent rib cage can be seen though her chest cavity as well as the metal table beneath her. She is a child and must treated as one, hence the importance of simulating such care. She is surrounded by five small children preparing to do the surgery. They are play acting with every child focused intently on the game. The little girl looks upon the viewer without judgement. Her face has the solemn countenance of youth. She trusts you. She hopes you will play the game with as great an intensity as she would. And she hopes you will see her as she is, open and transparent. When I was in high school, I loved two subjects: Art and Speech & Debate. I tried to balance the two worlds and do both. I also felt the voice of God within my life and would try to present that message within my work. I wrote speeches with biblical references and my wonderful debate coach would admonish me saying, “Now Regina, you are writing a speech not a sermon, stick to the point.” In art class, we were told to stay away from using religious imagery as it was considered controversial. In response, I choose to paint the hand of God as a tempera project studying the contrast of warm and cool colors. I was a good student so other than the occasional rebellious inclusion of God within my art I would keep them separated. Ten years ago I was working as a retail manager in the college book industry. I would attend many educational sessions at national trade association meetings. Several of these meetings stressed the importance of creating a mission statement. It became quite the fad to spend days in internal meetings creating mission statements. I was saddened to see many organizations create them only to shelve them away in some cabinet drawer or just mention them in a new employee packet. I saw far too many mission statements within organizations that were at best a corporate check off the box and were at worst a glaring lie when compared at their business practices. The term “Mission Statement” has a deeper meaning than that of a corporate fad. It is a term that has been used for generations within Christianity to explain the mission of Jesus Christ. Some hospitals today have mission statements that follow this older tradition. One such Hospital is Hendrick Medical Center in Abilene, Texas. 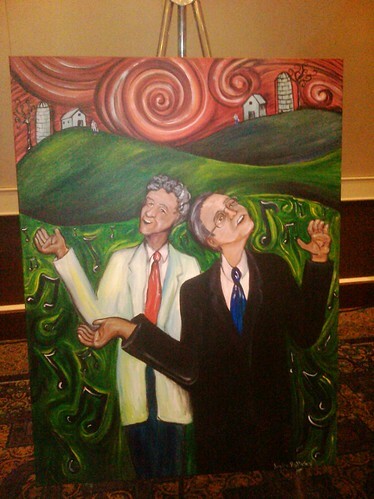 I had the honor of speaking and painting at Hendrick Medical Center on October 6-7th, 2011. Prior to speaking I toured the facility and saw their construction site as they are building several new floors within the hospital. Everywhere I turned I saw visual reminders of their mission on the walls and in the helpful smiles of those around me. 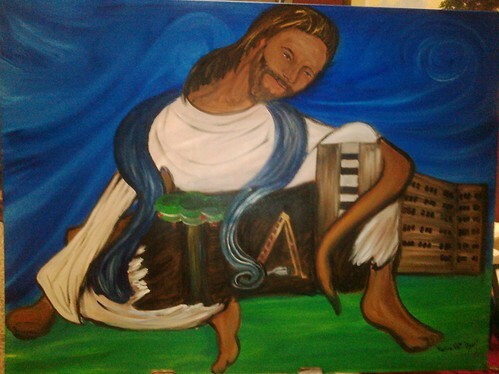 In this painting, the physical structure of the hospital combines with and is embraced by Jesus Christ. As Jesus wraps his arms around the structure of Hendrick he looks lovingly within. A large chasm of construction opens within the structure of Hendrick. The blue length of cloth descending from Christ’s body, spools within the frame and becomes data cables that terminate in a USB port. Beside the data cables, an open ladder stands steps rising to heaven. To the far left is a tree with apples upon it. This tree is painted in the style of the trees that are being built in the Pediatric Ward at Hendrick. 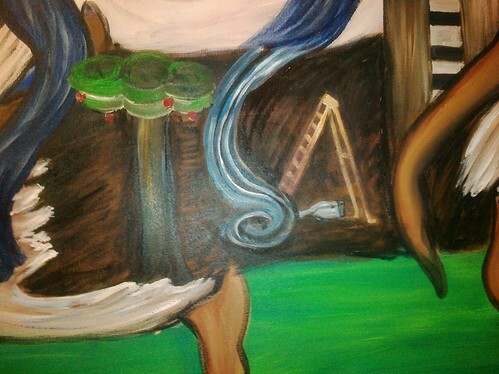 If you look closely at this painting, it will seem un-finished. It is under construction, just at the Hendrick Medical Center is. It is in the process of a continual striving to live and work within its mission and it shall never be complete. The architectural blueprints will always handy for reference and the mission statement never locked within a drawer. 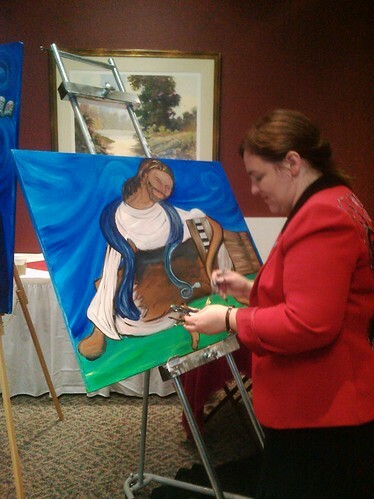 I was very happy to paint at Hendrick. It was the first time I have painted in the lobby of a hospital. I usually paint in front of a hospital, on public sidewalks where I cannot be told to cease and desist. 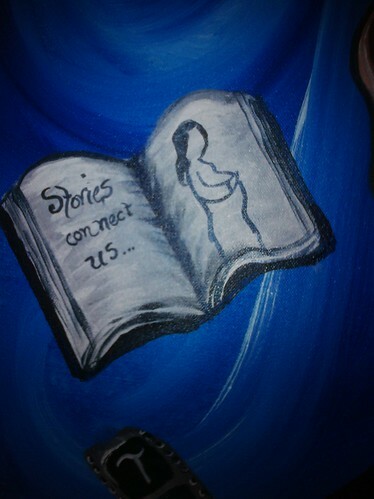 But Hendrick Medical Center Staff invited me in and let me paint right beside the information desk. 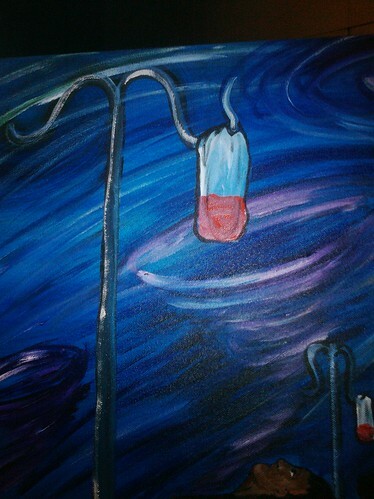 I could interact with any guest or patient that walked by my easel. I was once again inspired. I watched the helpful volunteer who greeted all who entered the door. I saw her as she is, was and always shall be. 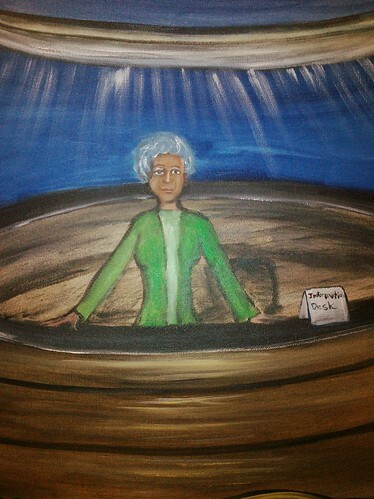 She stands behind the desk as an elderly woman greeting the visitor. Below the desk, she is the young woman who looks straight into the soul of the viewer. She maintains direct eye contact, as though to say at this eternal moment there is nothing more important than paying attention to your needs. Her long golden locks of hair swirl behind her. When you combine her youthful form with her elderly stance, those silhouettes create the Alpha and Omega. Above the desk, floats an architectural detail. It is a ring that repeats the circular form of the desk. It is also a halo representing eternal life and a sense of the sacred. Whilst I was painting this, a staff person remarked that I had included a halo within the picture. I pointed out to him the architectural detail on the ceiling. He was amazed having never noticed it before. I responded that we don’t always see God’s presence within our life, but he is always there to help us. Thank you amazing people of Hendrick Health System. Thank you for living your mission. Thank you for inviting me to speak and paint and talk about God’s presence in our life. If were are going to treat the whole patient we must address the body mind and spirit, and we cannot do that by keeping them separated. I have followed Gregg Masters as @2Healthguru on twitter since the summer of 2010. He has such a clear and powerful voice in our health care social media world. In his photo avatar his long white hair gives him the look of an elder or sage. In June of 2011, I saw Greg in real life. We were both participating in health innovation week DC and in meeting after meeting Gregg had amazing things to say. His unique voice was even more powerful in person. His hair white was shorn close and his every movement displayed vitality and vigor. We stood in an archway of a crowded room and discussed our lives. We were both single parents working in health care. We could completely empathize with each other’s plight of spending time away from our children, in order to travel and do our life mission. Gregg’s babes have long since grown, but he had walked this path before me and understood. As I talked with Gregg, I felt the serenity of his presence and it seemed as though he was filled with a powerful and soulful energy. When I looked at Gregg, he sparkled. So, that is how I painted him. This is “It’s only an egg,” Gregg Masters jacket. The background of the piece is a rainbow of contrasting colors swirling together in a vortex. Upon these writhing streams of color a scarab beetle slowly walks. Here the beetle represents the journey Gregg takes. It represents the concept of hope and rebirth. It represents the years of hard work, rolling the dung-ball uphill, to reach a point of personal fulfillment and professional success. In front of the scarab beetle Greg Stands. He smiles he his little half-smile as if sharing an in-joke with God. His sunglasses cover his eyes without distancing his soul, and an inner fire rises from his shoulders. 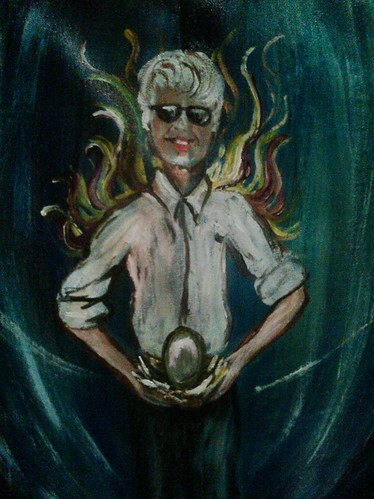 In Greg’s hand he holds a nest and an egg within. A series of Twitter birds fly away from the egg, as though scouting food, delivering messages or preparing the world for a new birth. 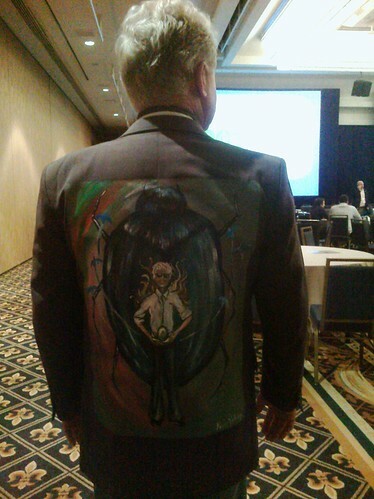 This jacket is the story of our movement of participatory medicine. Gregg’s voice is a voice that refuses to be silent, refuses to give up. In the daily grind of institutional medicine, there are many who say, “That is just the way it is.” “Nothing will ever change.” But Gregg cries out, Gregg questions. Gregg pecks at the interior of the shell and spreads fissures and cracks in the old way of doing business. He may look harmless, he may look saintly, and he may seem to be only an egg. But Gregg will break forth, and with many other disruptive ones, Gregg will fly.